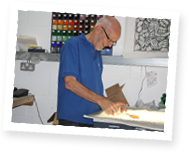 Since Creative Glass Guild began in 1979, as a stained glass design and repair company, we have been at the cutting edge of art glass in the UK. Many remember us being on Redland Road in Bristol, we still have the original stained glass shop sign on our wall today! 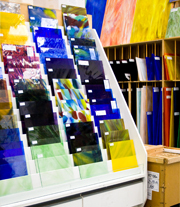 After moving to larger premises in Bedminster in 2000, the business became more and more focused on stained glass supplies, fusing glass and materials along with the sales of tools and glass kilns which has brought us to where we are today, in our modern, 7000 square foot premises in St. Philips. You are welcome to visit any time, just don't wear open toed shoes! We are strict on this policy. We have developed over 30 glass craft courses which we teach in our lovely studio spaces and our list of classes is still growing. From how to make stained glass to fusing, painting on glass and most recently, lampwork glass bead making, we have a glass course for everyone. In June 2004 the business was taken over by James & Deborah Paget. Since then the company has been expanded rapidly with more choice than ever being offered from the store. It is our mission to continue to grow and improve our service and products. We are focused helping our customers with great service and support with their glass work. We are a friendly company and like nothing more than our customers visiting us, spending time browsing and feeling free and happy to ask our team anything. 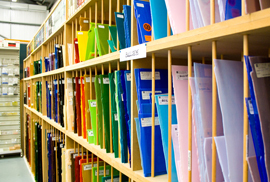 In August 2005, we launched our online shop for stained glass supplies, which, combined with a fast and reliable delivery service, has become very popular with glassworkers and schools across the UK and internationally. 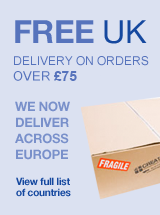 We take pride in our great service, low prices and fast deliveries. We are a firm who takes care of our customers and hold them in the highest regard. Feel free to visit our store, we welcome our customers seven days a week, and it is often better to see glass ‘in the flesh'. You can spend as long as you like browsing and asking questions about your stained glass or fusing work.